If you are short on time and can’t afford read all the reviews and excellent buying advice written by our team of researchers, this short paragraph should tell you everything you need to know about the best weather radios. In determining the best products we have looked at product popularity, expert reviews and last but not least feedback straight from the users. We have found that the MIDLAND WR300 is the best because of its great overall performance and features. This model comes equipped with the SAME technology that allows you to program the radio to receive alerts for the areas of your choosing, so you do not get alerted when something happens across the country with no consequences for you, unless you want that. The 90 decibel alarm will make sure you will not miss any important warning message regarding weather conditions, and this audio system is doubled by a flashing LED. Another important feature is the ability of the unit to let you know when an alert expires, so that you know right away if the weather turns for the better and there is no need for special action anymore. If the MIDLAND WR300 is unavailable, you can confidently choose the Sangean PR-D9W as it offers similar performance. If you have made your home in a disaster-prone area where calamities are part of your life, you should make sure you own the best emergency weather radio on the market as part of an emergency kit. An emergency radio is primarily designed to keep the user connected with the authorities and informed during crisis or disaster situations. This is highly important so you can deal with the emergency situation the best way possible to ensure safety for you and your family. By having that vital lifeline to the proper authorities during disaster and catastrophe, you will know what to do and be guided on the nearest evacuation sites, if the local government is taking steps to gather affected families at a certain point in town, or if there are sources of food and water nearby. Some models even keep portable devices such as cell phones charged. Power and communication lines are typically down during disasters, and this could cut you off from the world. Those precious few minutes on an emergency call could easily spell the difference between staying on the radar for those worried about your safety and losing every means to communicate with those who can help you out of the critical situation. A weather radio can even provide nighttime lighting when the power is totally cut off. This ensures that you are not left completely in the dark when the evening comes, so you can still navigate your way through and hopefully find help. A premium quality weather radio gives you a means to connect with the rest of the world as you rough it or just wait to get assistance where you are. Providing disaster and weather alerts, especially from the National Oceanic and Atmospheric Administration, (NOAA), an emergency radio keeps you ready for anything that could occur in your area, including chemical spills, Amber Alerts, tornadoes and fires. What does a weather radio do and how/when does it help you? Major disasters could strike at any time, and they include: major electricity blackouts; wide area floodings; fire, ice and heavy snow storms; tornadoes and hurricanes; earthquakes; explosions; and many other natural or manmade disasters that could harm people over a wide area. Major destruction and death could result from those occurrences. With the top weather radios of 2019, people can have a lifeline to rescue, emergency aid and a means of saving other lives. Receiving emergency radio communications from the proper people such as First Responders, Fire Departments, local TV and radio stations, or getting weather reports is crucial and this is what the emergency radio empowers you with. When your cell phone service or smart phone proves to be useless, an emergency radio may be your only link to the rest of the world. Getting a connection with your phone service can be a challenge when everything is down. Thanks to a reliable weather/emergency radio, that vital link to the world is not completely lost despite the chaos and confusion that disasters, whether manmade or natural, can easily wreak on one’s normal life. Giving you peace of mind, emergency radio communications could make you ready for the worst before it hits, with various levels or watches or warnings for your specific area. You will be kept informed of orders for evacuation by your local government so you can act swiftly and sensibly and prepare for the worst that is to come. How to choose a weather radio? A radio that can deliver NOAA alerts along with other warnings proves to be sufficient to meet the needs of most people. You won’t have to spend plenty of money on a shortwave or two-way radio if you don’t really need all those other bands. Communicating with other people may require a two-way radio. However, if all you really want is a connection to the rest of the world during an emergency or crisis situation, you could just get yourself a self-contained AM FM receiver. The AM band is specially important, as it is where NOAA alerts are channeled through. The local FM stations may broadcast such information, but in severe disasters, the AM radio that boasts a longer range than FM is a more dependable information source. 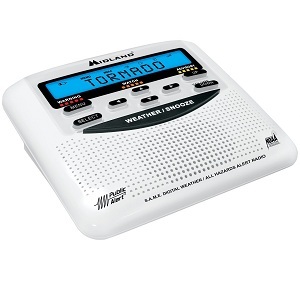 The best weather emergency radio with AM & FM also serves as a reliable means of staying informed and of being connected to the outside world. When making a comparison of emergency radios on the market, you should check out models that come equipped with Specific Alert Message Encoding (SAME). The protocol is utilized to encode the NOAA Weather Radio (NWR) and Emergency Alert System (EAS) in the United States as well as the Weatheradio Canada in Canada. Receivers are also set off in Mexico City and its surrounding areas. Plenty of all-hazards/weather radio receivers are geared with the SAME alert feature. Users can program CLC/FIPS/SAME codes for a specific area or those of particular interest alone instead of the entire broadcast area. Once the NOAA/NWS sends a SAME header matching the desired code, the receiver will decode the event, scroll it on the radio screen and sound an alarm. The receiver can pull in one of a number of National Weather Service network frequencies in MHz, with signals generally picked up to 50 miles from the transmitters. 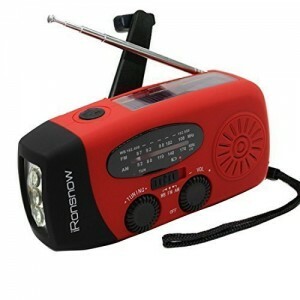 A battery-operated radio is a necessity, but its functionality is somewhat limited when you do not stock additional batteries in an emergency kit. To give you greater flexibility, check out emergency radios that can be powered using an external source, such as an AC adapter that can be used when power has not been cut off, or a manual charger or hand crank model when power is out. Although emergency radios are engineered to just sip power and not take too much to operate, more features in the unit could mean higher power draw. Be sure to take note of this when picking out an emergency radio. Make sure that the emergency radio can still fulfill its primary purpose even with the add-ons you want on it. It should still have more than enough power for alerts, or be kept alive with a hand turbine. The bottomline is, the unit should sufficiently address basic emergency functions and make efficient use of its power. You wouldn’t need a whole range of features if the unit is not able to provide power to fulfill its essential purposes: communication and information. You can choose which additional features you want to be present in your emergency radio. Some premium models can charge your devices. They are usually equipped with built-in battery packs that can be utilized for powering tablets, phones and other items. During an emergency, this is not overkill since you might have children in the family who will need a means to calm down while you think about what to do. Although this may not prove to be essential at all, a unit that has it available could help you focus without having to worry how to keep the kids occupied. Other models come with onboard flashlights, multiple programmable locations and stations, and extra charging capability via solar panels. You will appreciate a tough exterior as well, as it offers the ability to withstand falls and drops. Others are constructed to be portable or made for use with earphones, thus preserving radio life. With earphones, you are able to listen to broadcasts in privacy or without bothering everyone else in the house. Make sure the emergency radio you get can address your needs adequately during those critical situations when your safety and that of your family are primary concerns. In case you can’t afford a new product like those that we have and will tackle, you could at least look for the best free weather radio app for iPhones and Android smartphones. They’re available and can be downloaded from the App Store or the Google Play Store. Without a doubt, emergency radios are important items that should be in any emergency survival kit. There are plenty of models and brands available, so shopping for this kind of gear can be challenging. We have found the following models to be great buys for people who want quality and value combined. Empowering you to keep alert during emergency conditions, the MIDLAND WR300 Weather Radio is preprogrammed to pull in only those warnings that apply to your specific area. It has a Memory System that lets you assign it to receive warnings for a particular state or county, as well as nearby counties, also thanks to the Specific Area Message Encoding Digital Technology it comes with. The emergency radio is a single-speaker unit that provides 23 programmable codes for counties, and offers a user-selectable warning system that comes with a voice alert or a visual LED flasher, along with a 90-decibel siren alarm. The drift-free phase-lock loop technology that the MIDLAND WR300 utilizes provides tuning capability. You will be notified when an alert has expired thanks to the Event Expiration indicator that shows EXP on the display. This radio is powered via four double-A batteries or an AC outlet using the supplied AC power adapter. The product is specifically built to meet the requirements of emergency cases, so it receives all NOAA weather channels to know exactly when a bad weather alert is on. It comes with AM/FM radio, clock, and alarm. The clock is hand as it always allows you to know the time, while the alarm function can easily turn this radio into a daily use on. It has a memory system for around 30 counties, so you will know for sure whenever a big storm, hurricane or tornado is approaching the premises of your county. This will give you enough time to pack your bags and prepare for emergency cases adequately. This weather radio also allows you to add and remove alerts, according to your own preferences and needs. 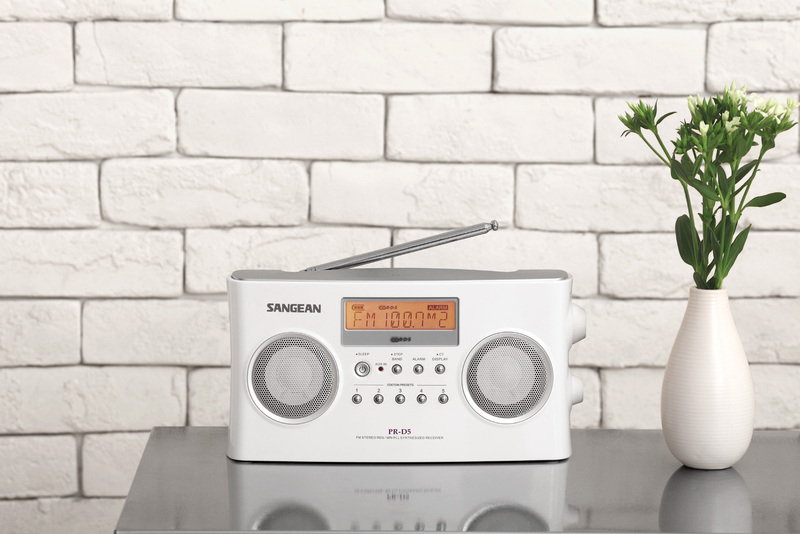 The item is not very intuitive so you will need to keep the user manual close to you whenever you want to change the date, set up the alarm or switch between different features of this radio. 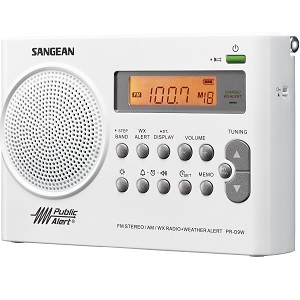 Offering portability and hassle-free readability, the Sangean PR-D9W has a large LCD screen that enables easy viewing of displayed information. The display is equipped with settings that enable adjustment to the backlight illumination, so you can change it to comfortable levels for you. The built-in radio pulls in AM and FM bands along with NOAA weather stations. The 19 memory presets enable you to choose your favorite stations. The Auto Scan feature helps you easily hone in on them. This is a great bedside alarm clock, as well. It enables you to choose dual alarm times and waking either to Human Wake-up System (HWS) buzzer alarms or to your preferred radio station. The emergency radio has low power consumption. You can have the radio on for more than 25 hours with four AA alkaline batteries installed. You can enjoy extra clarity with the built-in headphone amplifier. The radio has a supercapacitor that stores your memory and clock presets in case power goes out. The main feature of this product is its portability, meaning you can easily carry it around with you so that you always stay informed about bad weather alerts. The product features classic AM/FM functions and offers an automatic alert whenever hazardous conditions are due to happen. The secondary alert system features a flashing red LED light and an emergency siren, so you can always be warned. It comes with 19 preset stations for weather channels, and you can set this to your favorite radio channel as well. The rechargeable dry-cell battery provides you not only freedom of movement but also the option of being informed about the bad weather even when the power is off. The reception antenna is not efficient and powerful enough, meaning you will hear the radio stations broadcasts with intermittencies. If you are looking for a product to keep you updated on all frequencies, you may want to purchase a radio with a more powerful antenna. The American Red Cross FRX3 Radio keeps any household prepared for any emergency, natural or manmade. 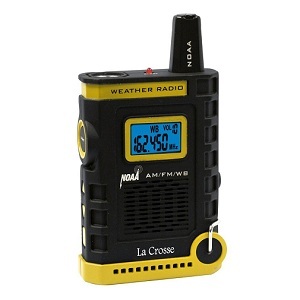 This rechargeable emergency radio receives all seven NOAA weather band stations along with regular AM and FM bands. 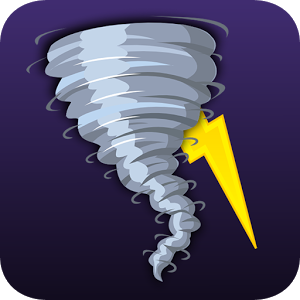 With the Alert function on, you can get automatic broadcast of emergency weather alerts for your specific area, and these include tornadoes, hurricanes and severe storms. Powering the FRX3 Radio is no problem, since you can set the solar panel out in the sun or simply spin the hand turbine for only a minute to enjoy from 10 to 15 minutes of flashlight or radio use. With the mini-USB included, you can have DC power. You can also use three triple-A batteries. The radio offers a sustainable power source for your portable devices that provide critical communication during emergencies, thanks to the USB smartphone charger. The USB port serves as a channel through which automatic dump-charging can be carried out to your phone- it’s just like plugging into a wall socket! If you’re looking for a cool radio with a unique design that will keep you informed anytime, anywhere, you cannot miss this product. It receives all important AM/FM weather band alerts to keep you informed and safe every hour of the day. One of the coolest features is that it comes with multiple power options so you can always count on it, regardless of the place you are or the conditions. It runs on regular rechargeable batteries, solar power, AAA batteries, and even hand crank. It is fitted with a USB port that allows you to charge your smartphone and tablet. The LED flashlight and emergency light make this product extremely useful in stressful situations. Even with so many charging possibilities, some of the customers noticed the radio stopped working after a few uses. Without the power button the radio, phone charger, and alarm are useless. On the bright side, you can still make use of a fancy flashlight in case of emergency. 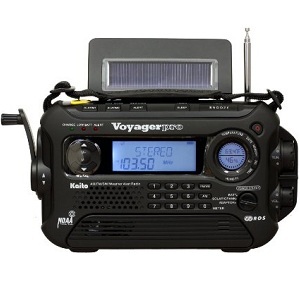 It always pays to have the KA600 BLACK Solar/Crank AM/FM/SW NOAA Weather Radio on hand in your preparedness kit during manmade and natural disasters and catastrophes. Offering longwave, shortwave, NOAA weather channels along with the regular AM and FM radio bands, the weather radio ensures you stay connected and informed during those critical times when word, any word, is your only lifeline to the outside world. This weather radio can be powered five ways: through the AC/DC adapter for an electric outlet or the car charging port; double A batteries; via the USB port of your PC; through the solar panel that harnesses the power of the sun; and by hand cranking. The KA600 BLACK looks solidly built for the most challenging uses during critical times. It provides NOAA all-hazards alert so you can keep abreast of vital information and the latest word from the proper authorities and agencies. It has a calendar function, an alarm clock with dual settings and a sleep timer so you can observe a normal schedule even when everything else around is confusing. This provides a means of maintaining order amidst the chaos. The weather radio can be tuned four ways: manual; direct digit entry; memory tuning and ATS, for reliable versatility and effortless use. 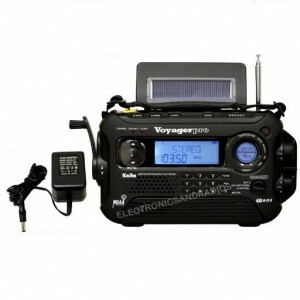 This longwave and shortwave, AM/FM radio stations provide all NOAA weather channels and comes with a backlit digital display for convenient use. It is powered by multiple sources, including AC/DC adapter, USB port, solar panels, hand cranks, and regular AA batteries. Some of its other functions feature NOAA hazard alerts, a calendar, as well as an alarm clock with dual settings and sleep timer. This can easily turn into your everyday radio and clock use, as well as the item you can rely on in case of emergencies. It also comes with a 5-LED reading lamp, a 3-LED flashlight, and a thermometer, features that can prove extremely useful during calamities or bad weather conditions. The main flaw of this item is that the antenna is not powerful enough so you may have problems with range receptions even in areas with reception. The shortwave feature is not very useful either as you will only get an intermittent reception. Keeping you up to date on all the latest hazard, weather and civil emergency information is easy thanks to the Midland WR120EZ Radio. This is a Public Alert Certified monitor that keeps safety simple by pulling in all seven NOAA channels plus Environment Canada stations. Those stations receive and display emergency warnings on floods, tornadoes, civil danger emergencies, severe thunderstorms, and plenty more in three various languages: English, Spanish and French. People who live in high-risk areas should have this emergency radio handy. The seven NOAA weather bands cover pretty much 93 percent of the USA, ensuring ample coverage for most people no matter where they live. You can program the device to emit an alert only when a selected location or locations are threatened by weather and other emergencies, thanks to the revolutionary SAME technology. This radio accommodates up to 25 counties in all, enabling you to monitor a wide swath of locations simultaneously or just be confined to a single one. It comes with a pre-installed SAME alert that notifies you when specific counties are threatened. This reduces the chances of panicking for all minor weather alerts and only keeps you posted about the important stuff. 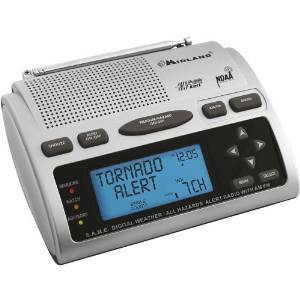 It receives no less than 7 NOAA alert channels, equipped with tornado, thunderstorm or flood warnings. The memory system allows you to add up to 24 counties for your own personalized alert. This weather radio also features a powerful 90 dB siren and voice alert for emergency cases, as well as additional flashing, LED warning systems. This way you will stay informed and safe no matter where you are or what you are doing when the alert comes on. The built-in clock and alarm or snooze features are useful for daily use. Some of the features on this weather radio are dated, as well as the overall design. If you also care about the design of your future weather radio, we suggest opting for other products. Is power down in your area? No worries when you have the Epica Emergency Radio in your emergency survival kit. This radio needs no electricity or batteries for power. It’s a multi-purpose device built with a water-resistant and compact design that makes it ideal to bring along when camping or going for an outdoor adventure. It recharges three ways. You can enjoy around 20 minutes of battery life with a full minute of turning the hand turbine. Secondly, this radio has a large solar collection panel that enables optimum charging using the sustainable power source that is the sun. Lastly, this emergency radio ships with DC and USB cords for use with an AC/DC converter or a computer. Providing charging and discharge protection, the emergency radio has a built-in battery with three years of life when the device is used for three hours a day. You can pull in local radio stations as well, for emergency instructions and news reports along with the seven NOAA channels for weather alerts. This compact and lightweight device is useful in all dangerous situations. It is easy to carry around so that you will always stay informed about future bad weather alerts or any other special events happening. The preset NOAA weather frequencies allow you to always stay updated regarding the weather, while the AM/ FM radio stations will keep you company throughout the day. 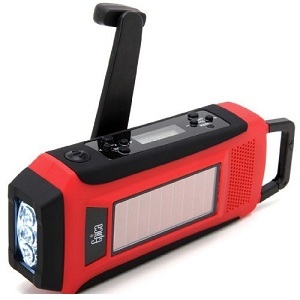 This lightweight weather radio also comes equipped with a 3-LED flashlight and a mobile phone charger. These features are extremely useful under hazardous situations and could prove lifesaving. You can charge the item in 3 different ways – with a regular plugin, solar panels or hand cranks. The rough and compact design will resist shocks and bad weather conditions so that it will keep you informed under all circumstances. When handling the unit, the control buttons seem to be quite sensitive and are easily pressed, which makes all your previous settings useless. Some of the customers complained about receiving defective units that won’t properly charge regardless of the charging method used. Engineered with an ergonomic, toughened design that makes it able to withstand the most rigorous settings, the La Crosse Sporty weather radio helps you stay ahead of the situation. It has a rugged profile with a slip-free rubberized body that enables problem-free portability. Made for active portability, the weather radio lets you stay aware of NOAA weather band channels. The LED backlight changes color to give you visual cues on the emergencies for your particular area, along with the Red alert indicator. This premium quality digital radio comes with a US-made chip that ensures excellent and reliable performance. The supplied lanyard can be attached to the anchor shaft at the bottom for maximum portability. The device utilizes three double-A batteries for power. It can receive all seven NOAA channels. The emergency radio features a 3.5mm earphone jack socket through which you can listen to information or your alert stations. The radio has speakers as well, so you can listen freely with other people. The product features all seven channels NOAA weather that will keep you informed in case of bad weather or natural disasters. The item is made in the USA, so if you buy it, you will also support the local economy. This high-quality digital radio is ergonomic and lightweight, allowing for easy transportation and placing no matter where you are. The rugged design is made with a non-slip rubberized finish to help you make use of the radio in all weather conditions. The smart blue LED backlight immediately turns red when there is a weather alert, helping you easily recognize dangerous situations even when you are not listening to the radio. The powerful LED flashlight and the earphone jack are also useful features in case of emergency or dangerous situations. The product is only powered by regular AA batteries with no alternative source options or the feature of charging your smartphone. Equipped with virtually every tool you will need to help you make it through the most critical times, the iRonsnow IS-088 Weather Radio runs on batteries and also gives the option of being hand-cranked to remain powered even when there’s no electricity. This Dynamo Solar Weather Radio pulls in AM and FM radio bands along with the essential NOAA channels to keep users connected before and during disasters, both natural and manmade. The weather radio weighs less than half a pound, ensuring easy portability. Put this in your emergency kit to keep you prepared for any eventuality. Geared with a 3-LED flashlight, the weather radio illuminates the darkness when power is cut off. The LED flashlight provides a lifespan of 100,000 hours and offers illumination of 5000 lux at a coverage of 120 mm, helping you find your way through the darkness easily while ensuring fail-safe lighting. The small 5 x 2.4 x 1.6-inch dimensions prove to be quite handy for easy carrying around. The user-friendly knobs and dial provide problem-free control and usage, so you can maximize its features and usability. The wrist lanyard offers a means of portability, enabling effortless carrying by the hand. The USB charging cable offers another means to keep the unit operating. The product is extremely compact is made for mobile use, meaning you can use it anytime, anywhere. The weather radio is equipped with AM/ FM NOAA Weather channels so that you can stay in touch in real time with all bad weather alerts. It can be charged in multiple ways – with solar energy panels or external recharge power options. 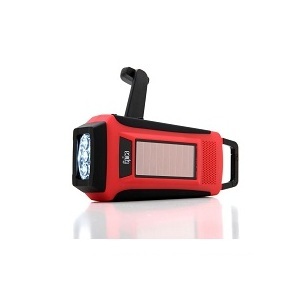 The product features a mobile phone charger via USB, as well as a powerful flashlight. Only one minute of hand-cranking will provide 5 minutes of radio use, as well as over 30 minutes of continuous torchlight or 5 minutes of cell phone talk time. The lightweight design allows for easy transportation and handling under stressful situations. The construction is rather flimsy, made of inferior quality plastic that won’t last harsh weather conditions or for prolonged periods of time. Some of the provided charging methods may not work so we urge you to check all the features of this radio before accepting it. An industry leader in the international arena of wireless communications, Midland has been producing state-of-the-art consumer products known for their quality and functionality, which include All Hazards/Weather Alert Radios, Marine Radios, Citizen Band radios, GMRS Two-Way radios, Bluetooth Intercom Systems and Wearable Action Cameras. The brand was primarily recognized as a maker of household electronics and CB radios in the 70’s and has easily been propelled into the forefront of the industry for developing and marketing revolutionary communication products aside from promoting preparedness for public emergencies. It has produced top quality two-way radios and is a recognized global leader in land mobile radios. Nearly three decades ago in 1986, Eton introduced its first shortwave radio. Ever the innovative brand, the company produced its first hand-crank emergency radio in 2002, the FR200. Eton is consistently driven by the objective to harness energy from nature to run a range of products designed to inform, entertain and prepare people for emergencies, These products are also engineered to accommodate the perpetually on-the-go lifestyle. 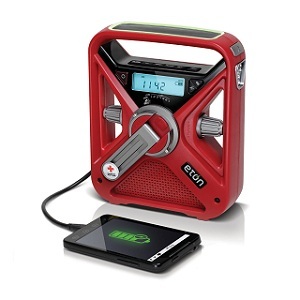 Eton has its extensive line of preparedness radios including the sought-after FRX3 American Red Cross weather alert radio. It also produces Bluetooth-enabled speakers, shortwave radios, and portable power backup battery packs that are either solar-powered or hand cranked. La Crosse Technology is a multinational consumer electronics firm servicing North America, Spain, Belgium, Italy along with other Southwest European countries, Germany and its surrounding countries. La Crosse was founded in 1985 and has adhered to a small-town philosophy of providing the highest level of customer service. The brand has an exceptionally extensive product line that includes:Adventure Series items that include a digital altimeter watch with compass, and a handheld anemometer; atomic analog and digital clocks, boasting the most accurate frequency and time standards on the planet; digital alarms; Alerts Mobile Hardware; Projection alarms; battery chargers and infrared thermometer; projection alarm clocks; wireless weather stations; and plenty more. Sangean, a US brand with headquarters in Santa Fe Springs, California, is a leading maker and marketer of consumer electronics including: WiFi/Internet; HiFi; World Band; Table-Top all in one Radio with iPod / iPhone Docking Station; Clock Radio with iPanufod/iPhone Cradle; Personal Pocket and Portable Atomic / Digital Clock, and Utility / Industrial and Correctional Institution Radios. Sangean Electronics is Sangean America’s parent company, which was founded in 1974. Sangean Electronics started out as a manufacturing and engineering company in the consumer electronics sector. Since then, it has built a strong reputation for making top quality products recognized for global quality standards and performance. Recognized in the US, Canada, Europe, and the rest of the world, Cobra Electronics Corporation has developed and manufactured navigation and mobile communications products known for unbeatable craftsmanship and quality. Founded as the Central Television Service Company by Carl Korn in 1948, Cobra used to provide repair service for the then developing television industry. Service equipment quickly became obsolete as the industry boomed continuously. This prompted Mr. Korn and his colleagues to explore the design, production and promotion of their own testing gear, which gave rise to B&K Electronics. Cobra came out with the first Citizen Band radio more than half a century ago and continues to develop more innovative products geared for driving enthusiasts, recreational boaters, outdoor adventurers and professional drivers. Arizona-based Ambient Weather has manufactured weather station and software that deliver tailor-made products and solutions for various sectors of society including the home, workplace, educational institutions, industry, government, resorts and media. The company’s remarkable progress in the electronics manufacturing sector has landed it a spot on Inc. Magazine’s Top 500/5000 Honor Roll of the most rapidly developing firms for five continuous years. In addition, the company was recognized as one of the 500 most widely patronized Internet Retailers based on annual sales in the United States, as reported by Internet Retailer magazine. The software package Virtual Weather Station is the brand’s frontrunning product. Founded in 1989, Oregon Scientific, which has headquarters in Portland, Oregon, USA, takes pride in being a company born out of a philosophy of taking the various amenities of a modern urban lifestyle and balancing it with a good dose of respect for the outdoors and the environment. This concept of Smart Living has been the essence of what drives Oregon Scientific to improve lives by living more sensibly and not just doing hard work. The brand’s array of products are manufactured by combining passion, precision, motivation and innovation to make daily life a whole lot easier and more convenient with a perpetually renewed and reinvigorated outlook along with a revolutionary way of addressing regular needs. The company produces weather stations, digital clocks, projection clocks, smart scales, pedometers, blood pressure monitors, digital video cameras, emergency alert weather radios and more. Whether you live in an area where storms visit more regularly than abhorrent relatives, or manmade or natural catastrophes are as unusual as snow on a lovely summer’s day, a good quality weather radio should be part of your family’s emergency kit, or preparedness package, for that matter. A weather radio is capable of picking up NOAA National Weather Service broadcasts, weather alerts, watches, warnings, forecasts and a variety of hazard information 24 hours a day, along with weather alerts on regular AM and FM stations. NWS forecasters send a special tone to activate local weather radios and interrupt normal broadcasting when severe weather conditions hit. Some models that incorporate a siren feature give off a weather alert that quickly provides information about a potentially hazardous emergency situation. Tornado warnings are broadcast immediately upon their issuance thanks to how weather radios serve as indoor tornado sirens that can be heard even during heavy thunderstorms or at night. A weather radio provides vital weather information to help users stay connected and informed especially during life-threatening situations. This includes: marine forecasts of seas and winds; forecasts of temperatures, winds, clouds, snow and rain; current weather at most cities in a specific region; warnings of severe winds, thunderstorms, heavy snow and floods; short term forecasts that predict where fog, thunder, snow, rain and others can occur; climate data such as precipitation and temperatures; special information statements for weird or notable weather occurrences. Daily forecasts are issued routinely every 6 hours, while short term forecasts should be given more frequently. Every hour, the current weather forecast is issued. Watches, warnings and special statements should be given during instances of potentially hazardous or irregular weather in the area. The regular AM/FM radio stations do not issue NOAA weather radio warnings and information, which only a specially engineered receiver can pull in. One can purchase weather radios from discount, department and radio vendors for a comparatively low price. A watch or warning triggers the weather radio on thanks to an automatic alerting device on the unit. Highly-portable, pocket-size compact battery-run radios are available. Models with alarms can be as large as a book. Most models are ideal for office and home use. Portable models are handy for on-the-road applications. Some models are turbine or hand-cranked or desktop. It is best to compare up to three weather radios at a time to know which is suitable for one’s needs. What Makes Weather Radios Unique? You can easily get local weather updates via the regular AM/FM bands, along with rain and snow details on weather service radars or emergency warnings about potential weather hazards in your area. However, with a quality weather radio, you can enjoy pure weather information broadcast 24 hours a day without interruptions. For sailors, fishers and hunters, a weather radio is the best source of information on erratic weather conditions and situations, issued continuously 24/7. One can get NOAA Weather All hazards simply anywhere. NOAA Weather Radio channels issue warnings, alerts, watches and other information from weather service offices all over the country. Throughout the US, one can select from more than 370 locations, including Puerto Rico, with reception being reliable within around 30 to 50 miles from each transmitter site. The weather radio has to be positioned by a window facing the most proximate National Weather Service transmitter. It has to be placed away from computers to avoid interference, ideally in second floor windows. The unit can be tuned to any one of seven VHF frequencies through which National Weather Radio (NWR) provides broadcasts. Make sure the reception is optimal and use a larger external antenna to ensure this when you live near mountains or in an isolated area. Use Specific Alert Message Encoding (SAME) to program use of the unit to only broadcast alerts from your desired counties. Most weather warnings and watches are preceded by a special 1050 Hz alarm tone. Keep unopened batteries handy as power backup in case electricity gets cut off. Owning an emergency survival radio can be comparable to having a lifeline to the outside world when you are cut off from everything, making the device perfect for backcountry camping as well as emergency preparedness. However, it isn’t unusual for buyers to have issues on the emergency radios they purchase. These issues can include concerns about the quality of the overall reception, which may not be that great at all. Other buyers rue the fact that some models do not come with a digital receiver, which offers easier control than a rotary dial. Finding the stations you want will prove more challenging with a non-digital receiver dial. Flimsy plastic casings are also an issue, as emergency radios are primarily intended for use in demanding outdoor conditions. Although the emergency radio gets the job done, it should be built solidly to ensure reliable use in any condition. Oftentimes, some models have a recharging time that doesn’t correlate to the battery life. You should reconcile yourself to the fact that even if the unit takes a long time to charge, the battery life will not be guaranteed to be commensurate to the charging time. In addition, there can be a significant disparity in the AM and FM station quality when the radio is used in both backcountry and city settings. Several models may show distortion on plenty of the stations, and that can even include use in the city. However, premium models are consistently clear. Emergency crank radios are not designed to deliver mind-blowing audio even with the volume turned up high. You could always get yourself a loudspeaker to handle the issue, though.